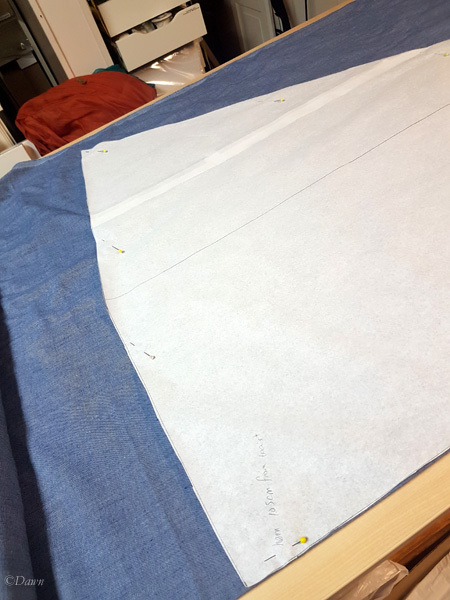 Once I did three toiles for the V-neck Burgundian gown pattern, I made more adjustments, giving the hem approximately 100 cm/panel (for a total of a 400 cm hem circumference when it will be done). 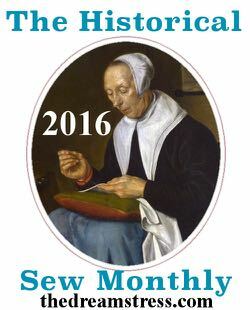 I used the Tudor Tailor kirtle pattern for the sleeve, rather than drafting a sleeve from scratch. I used this pattern previously for my Italian gowns, and was happy with the result. 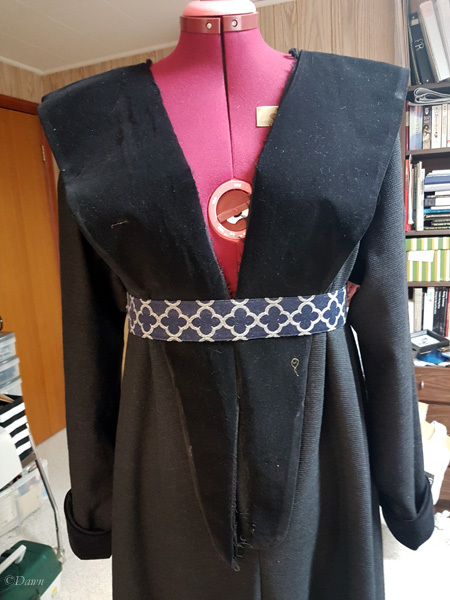 From there I re-drafted the back collar, and drafted the cuff facing and the front collar. 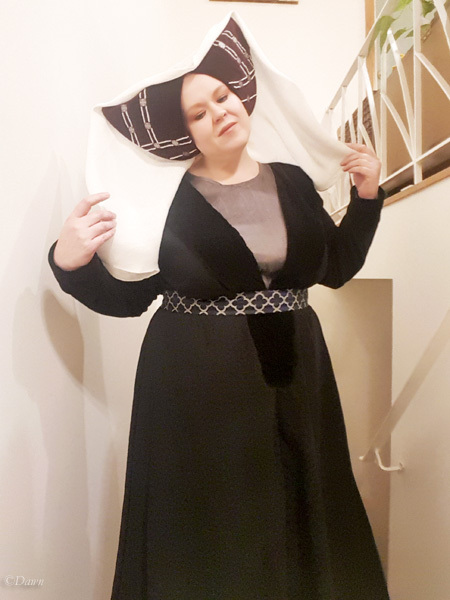 Despite the suggestion that the collar for this gown was cut on the front gown, I found that with my large bust, this was just not giving me the look I wanted, so I opted to do a separate collar (and facing) instead. 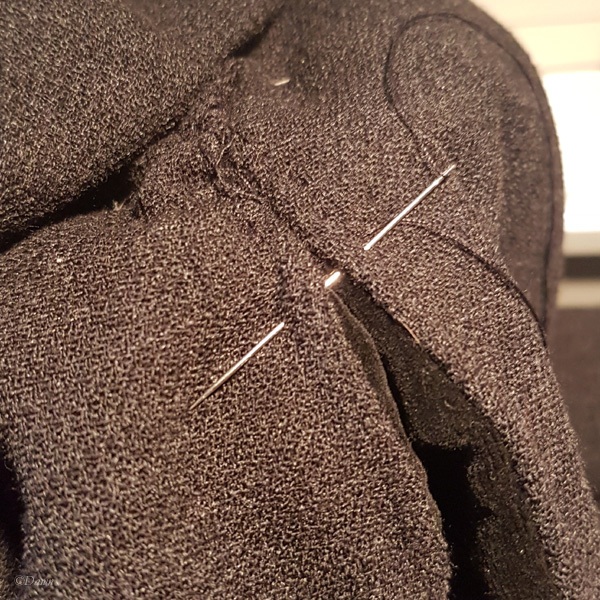 The fabric is 100% wool suiting from Fabric.com. It’s charcoal grey, and has a bit of texture to it – almost like a waffle knit – but in a woven fabric. I bought it expecting it to be a smooth fabric, but then with the texture I didn’t feel it was right for what I had in mind originally. I bought 10 meters though, and was glad to use it for something! I don’t recall what I paid for it, but probably somewhere in the $6-10/meter to have bought it sight unseen. 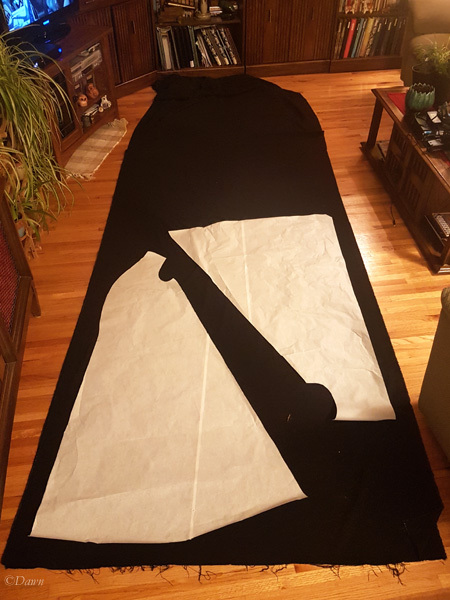 Ultimately I want to make this gown in a silk damask – but after three toiles, I was nervous about cutting the silk… so I thought I’d use this wool instead… kind of like a wearable fourth toile to work out some of the last issues. Since the fabric is not napped, I took a chance and cut the panels with one facing up and the other down. 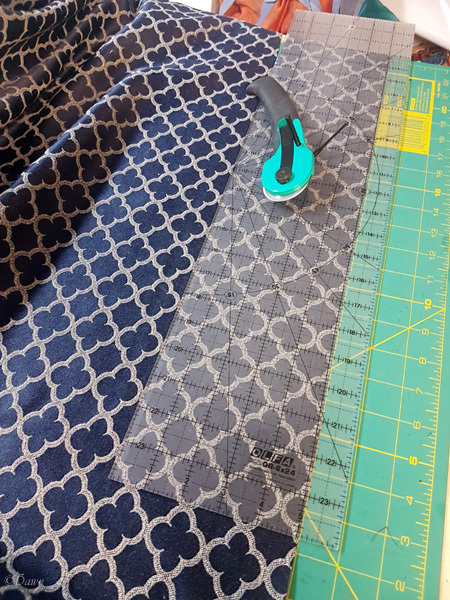 This helped me conserve a lot of fabric, though I know when I cut this out of a one-directional fabric like the silk damask I intend to ultimately use; this more fabric-conservative cut won’t be possible. 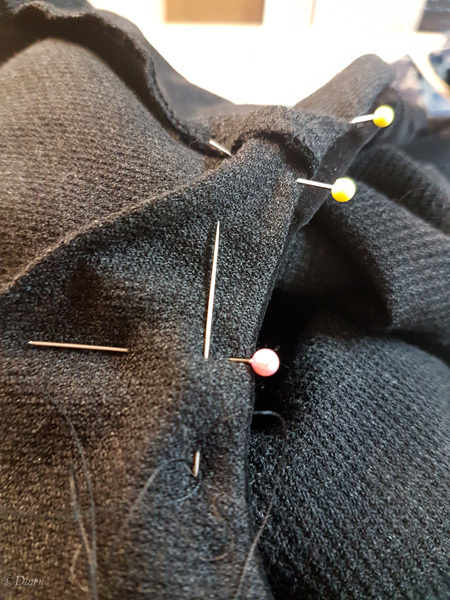 I cut the cuff facings, collar facings, and back collar from black cotton velveteen from a second-hand skirt I was given by a former teacher. 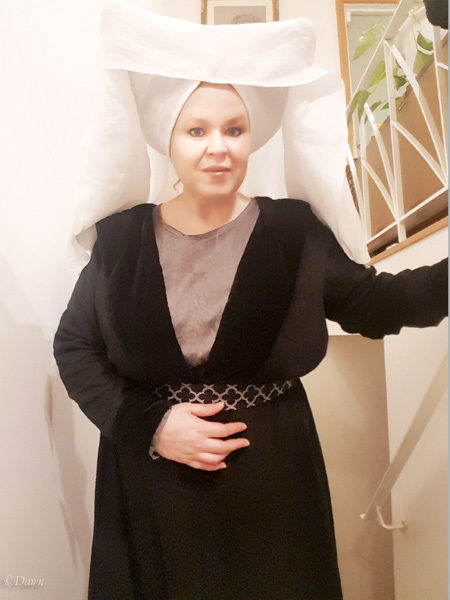 When I make this gown in finer fabric, I might consider silk (rayon-blend) velvet, a finer cotton velvet, or low-pile fur… but for now this will hopefully give the lush look, while gently contrasting with the grey gown just enough. Reviewing the length and fit of the collar – at this point it isn’t sewn to the gown yet. From cutting to this point was about 3.5 hours. This doesn’t account for ANY of the time in developing, testing, and altering the pattern. 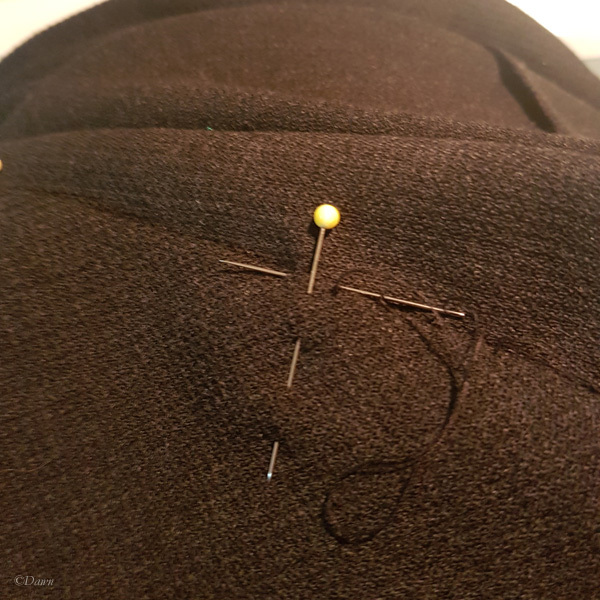 press all the seam allowances on the gown, press the sleeve cuffs in place. This was another 3 hours… and… other than washing the gown – it’s good to go! I chose a “mixed fibres” (burn test suggests poly-cotton) upholstery fabric I bought for 4$/meter on sale at Fabricland. It is blue with a clover pattern. I think before I make my silk gown, I’d like to find a proper buckle the right size. The closest I can find is this one from Raymond’s Quiet Press, but it’s only slightly wider than what I already have… it’s also nearly 80$ Canadian for the set… (From the website too). Armour and Castings has a buckle for nearly a 3″ (75mm) belt in the burgundian style. It’s quite plain though… but only $15 US. In contrast, they have a set with a buckle, three eyes, and strap end for $55 US… which is much nicer – but again, getting pretty expensive for a costume that isn’t even kind of my usual style. Tandy has buckles as well, though the largest they list online is 2.5″ wide, and they’re entirely the wrong style. The place I use for hardware typically, doesn’t list any buckles even close on their website, but I know from experience that they have a lot more in store than on their website. Likewise Three Star Fabrics usually has a wide variety of costume hardware, though the selection is inconsistent, unpredictable, and of course… they don’t have a website with an inventory. Bractea has some lovely photos.. but no idea of cost on the Burgundian ones, and no way I can see easily to order online… sooo.. not helpful. On Material Culture, the writer notes a number of paintings and wardrobe accounts from various places depicting the wide belts, called “Brode harnysed girdilles“. She identifies the most common colour being black, followed by red, green, gold, white, purple, and blue. She notes that although they are typically considered Burgundian, “they seem to have been fashionable in France, Flanders, and England too”. I’m really happy how the grey wool gown fits and looks. 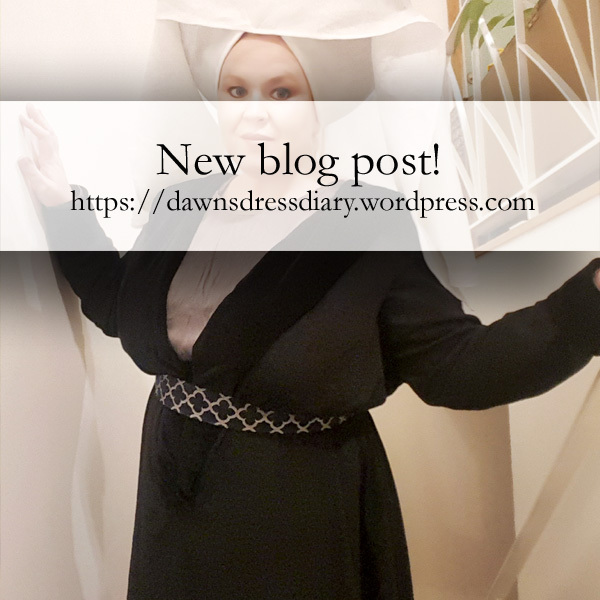 The neckline is “right” looking to me – even if I know that there are darts hidden under that collar… The sleeves look right to me, and the fullness of the dress feels right for the gown. However, I know that I want to make this gown in a silk damask, so there are a few things I’ll do differently. 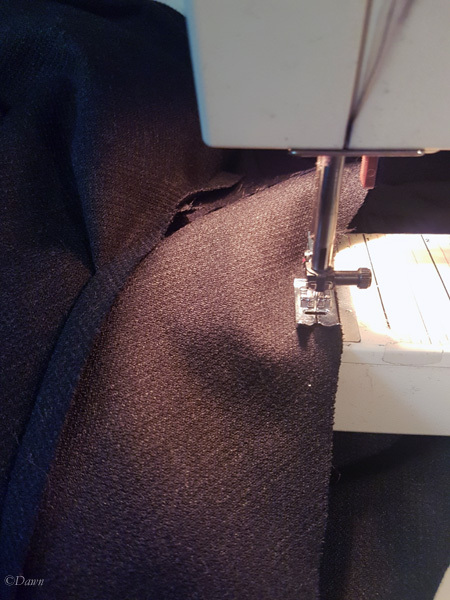 I want to make the skirt fuller for the silk version – because I will have to do the layout ‘with nap’ – I think I will make the sides wider if the fabric accommodates it. I will likely also add a gore to the centre back like some of my inspiration bloggers did. 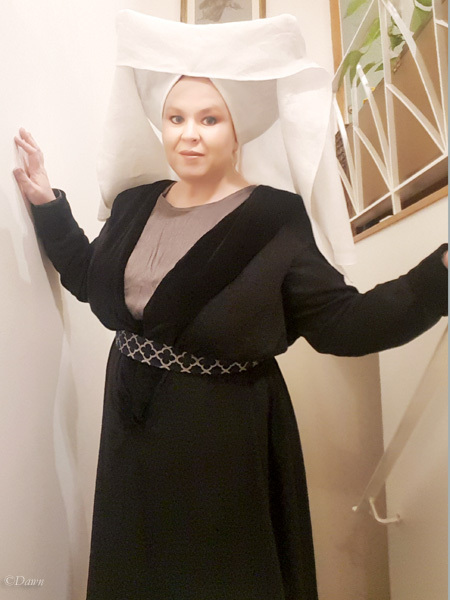 I added a slight rise to the shoulder of the collar on the grey gown – I think for the silk one I will remove this. I really like the velvet collar, but I might also look for a low-pile fur for the silk version too. I almost certainly will line the silk or interline it in order to give the silk more body. 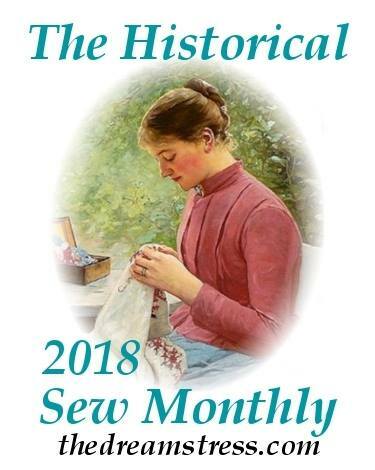 The lining wasn’t at all necessary for the wool dress, even though it’s likely more historically accurate. In the photos here I’m wearing the gown with my simple silver silk underdress – but this is NOT the right kind of underdress for this style. 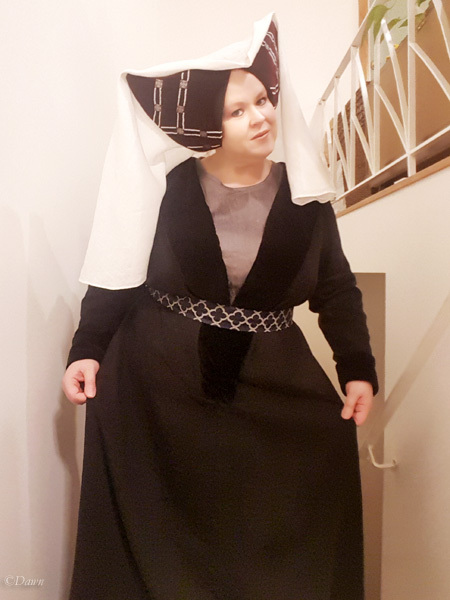 I need to make a proper cotehardie for this gown… but I didn’t have time to draft and fit a cotehardie in time for this gown to be done for Twelfth Night. 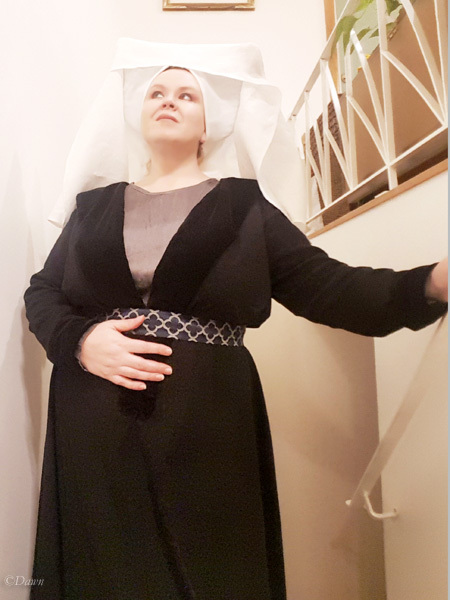 Before I make the silk V-neck Burgundian gown, I definitely need to make a proper cotehardie – hopefully in a thin wool with very fitted sleeves to fit under the straight sleeves of this gown. Come follow me on Facebook to see more of what costume (and other) projects I’m working on! You can also see some of my work-in-progress photos if you follow me on my Instagram account. 15th century horned hennin. In this photo you can see the length of this particular veil. 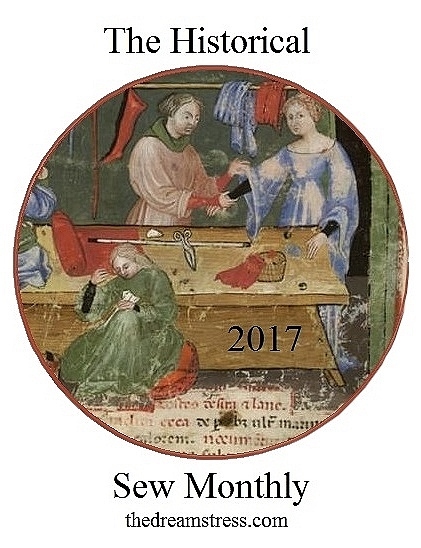 To accompany my new horned hennin, I want to make a V-neck Burgundian gown. This has actually been on my wish-list since 2014, so this is a good time to start looking at the styles. 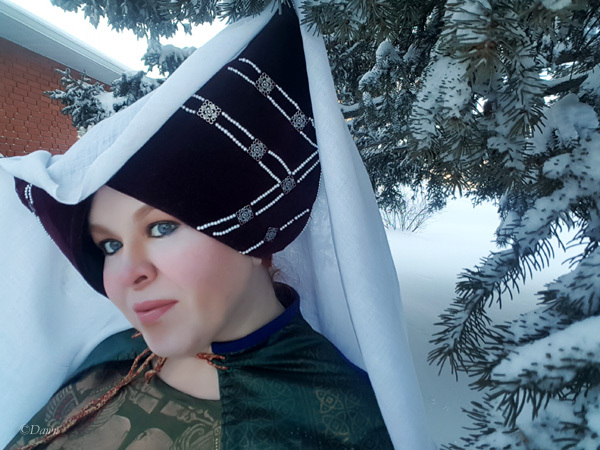 On January 20, 2018 I’ll be presenting my research, documentation, and finished hat for comment only at Montengarde’s Twelfth Night. I’m not entering the competition to be Montengarde’s next A&S champion (since I only stepped down as Kingdom champion in November!). I wanted to share my documentation here – in case I need a digital version at the event! 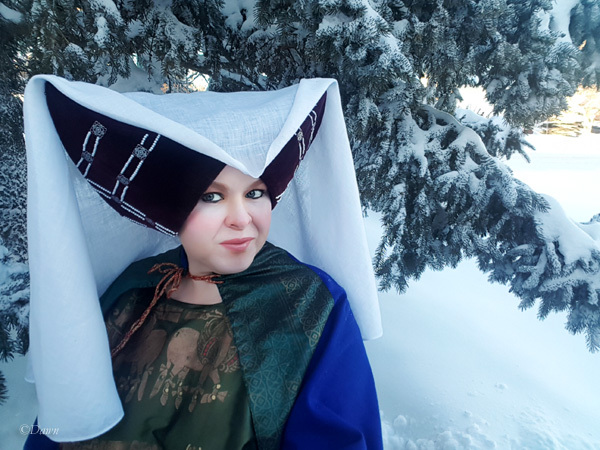 To see the full blog post with even more photos of construction/etc, visit my horned hennin blog post, or click the category for 15th century French to see more research, accompanying garments, and other projects from this era. 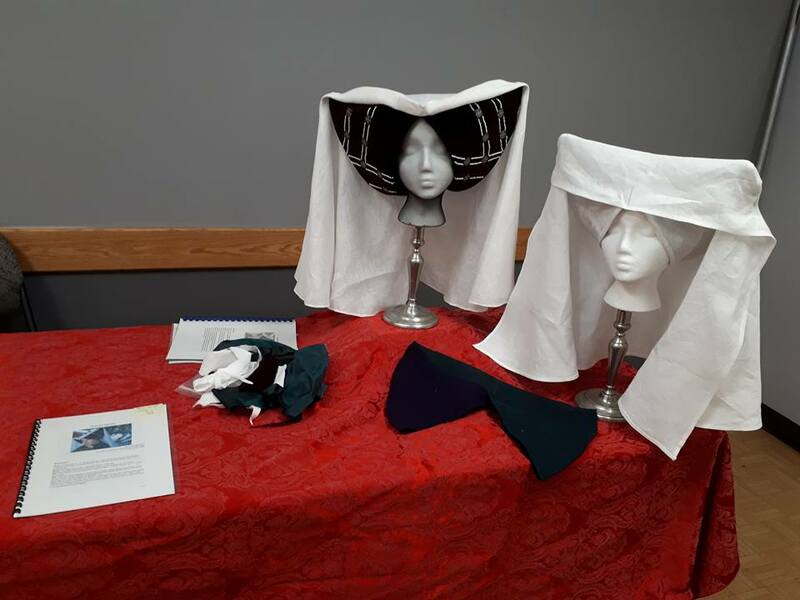 Here’s a photo that the Baroness of Montengarde took of my display at Twelfth Night!